Buy the best drones on a budget. Drones have become the new fun gadget on the market and even pros use it too. However, If your needs are more attuned to a beginners’ model, its ideal to play around with the cheaper drones . Good thing is there are drones available on the market now that are under a $100. As you get started though, it would be best to also check the FAA website to understand rules and regulations. Yup, there’s some level of governance over the use of a drone. When you’re ready, we’ve gathered the best drones at an affordable price. These inexpensive models are good enough to take real pictures and videos too. This guide can help you can choose the best one for you depending on your needs. Our picks work well for both indoor and outdoor use with fly times between 7 to 9 minutes of continued use. We’ve included picks that have kid/beginner functions like one-key controls and switchable 2-speed options too. Moreover, even on a tight budget, these picks include extra features and accessories that make for additional fun. The DBPOWER MJX X400 comes from a well-known name and is popular among budget favorites. See, this sub-$100 model tops the drone world’s budget options from great design to stellar performance. The DBPOWER MJX X400W easily earns our “Best in Value” for its full-featured set at the best price. For one, it shoots 720 HD videos that can be directly accessible on your phone. With this, you get the full drone’s-eye-view on your phone screen as you keep it fastened on the remote control. You see what your drone sees from the sky as you drive it. Also packed in this model’s design is an easy control option for “headless mode”. It means regardless of orientation, you can easily control the drone’s direction as you please. 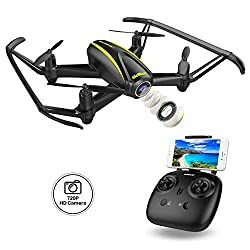 This makes it an excellent beginner drone. Moreover, you can enjoy a 3D view of what the DBPOWER MJX X400W captures by connecting a VR headset. Some customers say it’s too light and gets blown off course easily. Costing less than $100 with an excellent feature set, the DBPOWER MJX X400W makes for a great beginner drone. More than that, it has a good camera and a WiFi feature that gives you the drone’s view on your phone. Getting all that under an affordable price tag, easily wins it our “Best Value” title. 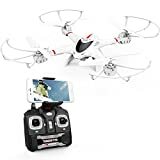 Most didn’t think they’d actually get a decent drone under $50, but that was before the Syma X5C. 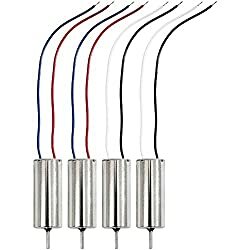 It makes a great choice for quadcopter fans and there are great reasons why it’s one of the top choices in Amazon. That’s because despite being cheap, you get a good feature set with the X5C. 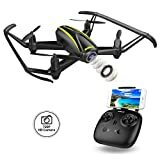 For a low price tag you get the perfect beginner drone with a 720p camera. With that, you can enjoy capturing eagle-eye views of the world around us. Additionally, it’s designed with a six-axis gyroscope for stable flying indoors and outdoors. However, you’ll want to keep it away from windy weather and locations. When it comes to flying time, you get up to 7-minute flight time with model from a 90-minute charge. Easily gets blown away by winds. The X5C offers a fantastic deal for first-timers. It’s a drone already popular in the quadcopter world. With a fair battery life, a built-in camera and stellar range for beginners, we highly recommend it considering its overall value. 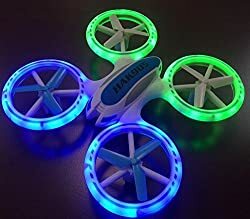 Haktoys HAK905 makes a fun night-party toy out of a drone with its design. It comes with a set of frames that lights up in colorful bright LED lights. It’s a beauty flying over a dark indoor space or outside the night sky. More than fancy lights, the HAK905 also comes with 2-speed controls and can do 3600 aerial flips. Then, with its Li-Po battery, you get to enjoy uninterrupted flying time of 9 minutes from a 45-minute charge. Moreover, it can fly over a wide 350-range without interruption from other drones in the same area. That’s because it uses a 2.4GHz frequency for controls. Finally, with its six-axis stabilization tech you can enjoy a smooth flight with the HAK905 without hitting walls. Most user complaints were due to defective units. Other than that, the product works great for its price. The HAK905 packs a ton of fun. Kids especially enjoy its light-up feature and find this model easy to control. Its range and build is best for indoors but it’s still okay for outdoor use. Additionally, though its range isn’t as great for outdoors compared to the Drocon U31W it’s still a lot cheaper. It’s definitely a drone newbies can enjoy. The Drocon U31W may be a budget option but it packs an excellent quadcopter feature set that surprises most buyers. It earns our “Best for Outdoors” title for a number of good reasons. For one it provides HD video and pictures with a solid 1200 wide range lens. More than an HD camera, what makes the Drocon U31W perfect for outdoors is its legit barometer. This feature built-in to its “altitude hold mode” lets you hold your drone altitude accurately. This means being able to sustain continued flight at the same level while you capture perfect selfies and aerial shots. Plus, you get awesome shots too with its full 720p HD camera. When it comes to controls, you can choose to rely on its standalone controller or use its smartphone control mode. Controls are easy and intuitive coupled with a VR video mode for easy remote flying via your phone. Its easy controls make it great for children and beginners. Now, if you’re worried about getting cheap for cheap, you’ll be assured with its 1-year warranty. This means your unit is protected from any factory defects. Users feel the flying time is too short. With a great range, altitude control and other amazing features, the Drocon U31W makes an impressive choice for its price. While it’s marketed for children, this full-featured drone impresses any age. Sometimes, great things come in small packages. In this light, the inexpensive H107C+ drone. This miniature drone comes with great features for a fun flying experience, with a price tag under $50. You wouldn’t want to practice on a pricey model, which makes a low cost mini drone a good place to start. The Hubsan H107C may be cheap but it gives you a good 150 feet range and comes with a 720p camera. The camera may not get you award-winning pics but quality is good enough You can keep flying for 7mins on a 40-minute charge and keep it stable afloat with its altitude hold feature. If you’re worried about controlling this palm-sized model, there’s not much to worry about. Since it has a six-axis gyro it gets increased stability. It keeps a smooth and stable flight enough for you to capture nice pictures from the flight. A few customers had problems with calibration due to defective units though replaced without a problem. The Hubsan H170C+ flies on a fair battery life for its size and price. It also comes with a good quality camera for a miniature and provides semi-stable footage. Additionally, this model is easy to control and comes with beginner features to help a newbie learn to fly. 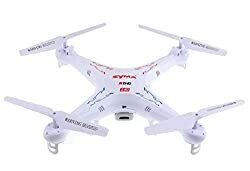 Considering its very affordable price point, it’s quite a miniature wonder and a good choice for miniature drone fans. If you’re graduating from introductory drones, here’s solid choice for intermediate drone fliers, the Holy Stone F181. It’s an affordable quadcopter that takes you to the next level of drone flying. The Holy Stone F181 is easy to fly and comes with an altitude hold function for taking steady photos. Meanwhile, as you learn controls you avoid damages with the help of its propeller protectors. Additionally, its body is made of sturdy ABS plastic that protects from any altitude bumps. Furthermore, controls are easy to get used to with its video-game-console like design. This remote is powered by 4x AA batteries that last a good 30 days of use. Meanwhile, the unit itself is good for 9 minutes of flying time on an 80-minute charge. As for pictures, its 2-megapixel camera may not be the most impressive. However, it shoots stable pictures. The Holy Stone F181 comes with sturdy build and good feature set. However, its camera isn’t as impressive and cannot provide a live feed of the drone’s view. To be realistic though, this feature usually comes with the more expensive models. Taking off beginner training wheels like headless mode, and the one-key turn is can mean preparing for some damage. However, this drone is sturdy and ready for that. This makes the Holy Stone F181 a fantastic drone choice for intermediates. Looking for the best place to start in the drone world? 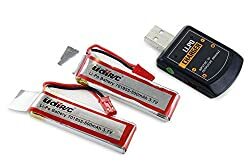 The UDI-U818A is the best affordable choice to get you ready before you jump into more advanced flying. An early note though, equipped with a 2 mega-pixel camera, it doesn’t have the best for video and photography. However, if you’re simply out to sharpen your flying skills and practice on a cheap model it’s a great choice. Just keep the expectations on par with its price range. The UDI 818A is easy to fly even for an inexperienced pilot. The controller: sports, albeit boxy and comfortable, provide an easy to understand control design. It’s not too hard to keep this bird in the air. Meanwhile, though the UDI 818A doesn’t have a smartphone/WiFi device feature, you can rely on its LCD display. It gives a view of thrust, battery level, and signal strength while you fly. Better keep an eye on this info too because it has a 90-feet max height with no warning feature. That’ll help you keep it from dropping off the sky. This drone gives you an 8-minute flying time through its 500mAh battery. It takes a long 2-hour recharging time but you can also opt to purchase spare batteries for only $10. The UDI 818A is fun to fly and easy to keep in the air. It gives a fair amount of flying time for its price. It’s easy to understand controls and stable 6-axis gyro makes it the perfect drone for beginners. The best affordable drones come with good flight time and recharge time. We’ve listed models that go from 7 to 9 minutes in-flight. 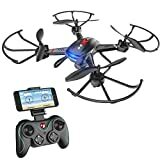 Despite being under a $100, some of these quadcopters even come with smartphone control and an HD camera. For a competitive price, you get cool features, a lot of fun and outstanding video and images. The best of the bunch? We’ve picked the DBPOWER MJX X400. For a fair recharge time, it gives one of the best flight times. Plus, it has a camera good for HD video and pictures. Overall, it has an impressive feature set considering its price. Feel like we missed something among our picks? Let us know in the comments below. Check also our review about the best remote control helicopters of 2019.